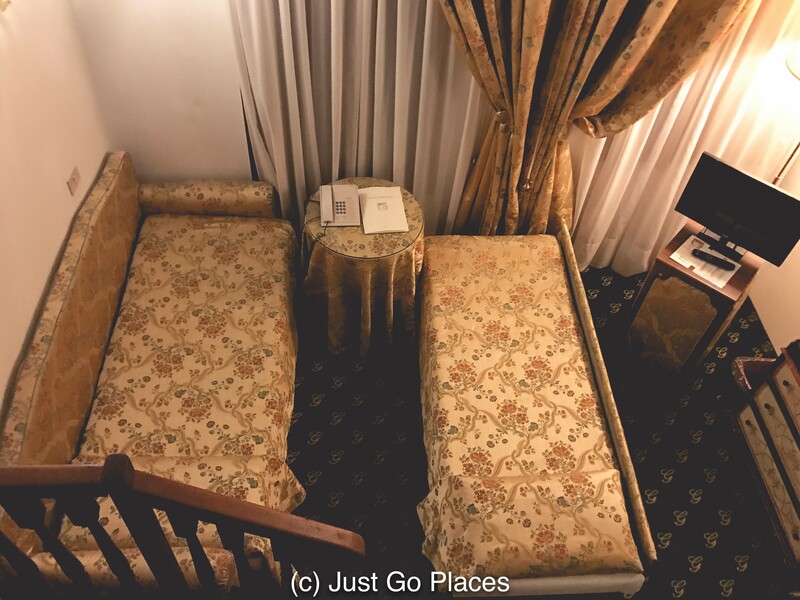 We were scrambling to find affordable accommodation during our trip to Venice for the famed Venetian Carnival. 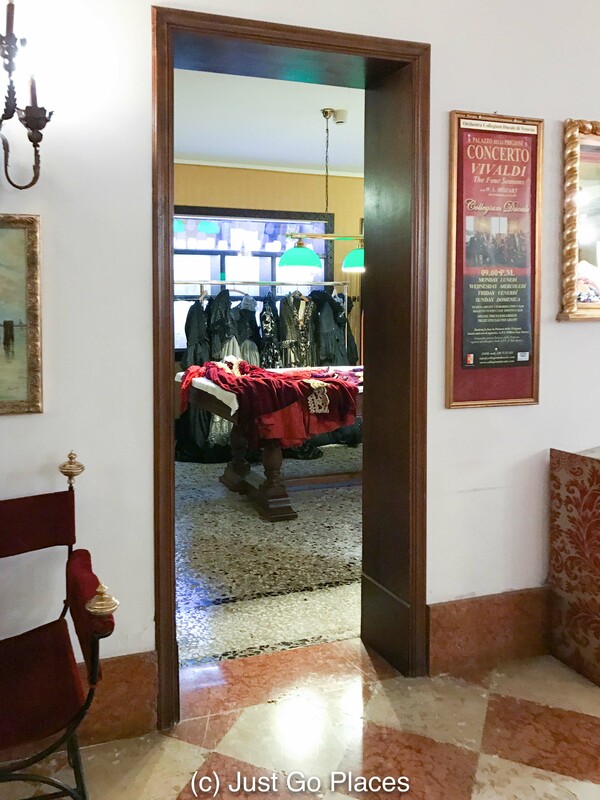 In the end we found a good deal at the 4 star Hotel Giorgione Venice. 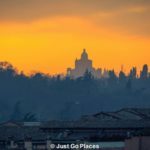 Located at the convenient end of Canareggio, we had a good experience and even managed to avoid the Carnival crowds (no mean feat I tell you). It’s always good when you feel like you’ve feel like you’d found sanctuary at your hotel. 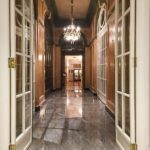 Different from our usual hotels, the Hotel Giorgione Venice is a converted historical residence which is still decorated in the classically elegant Venetian manor. 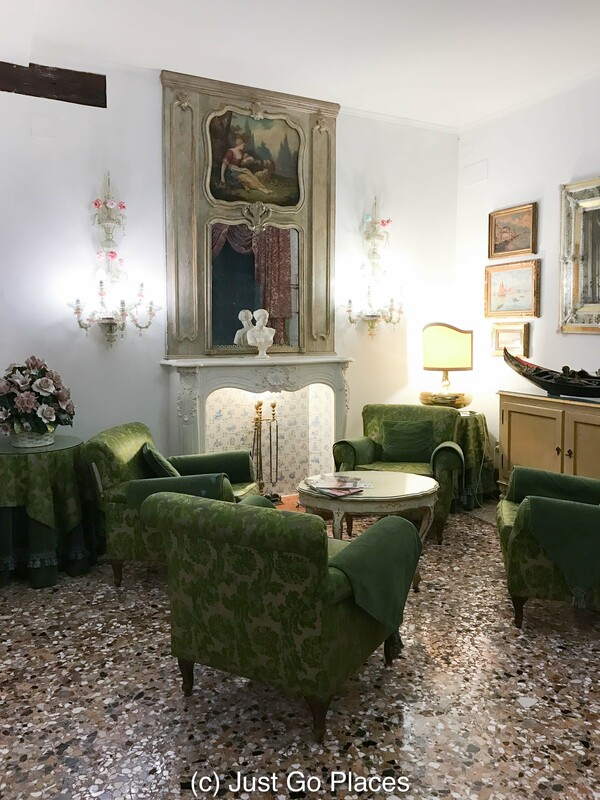 Think lots of Murano glass, terrazzo floors and heavy traditional furniture. It’s like if your Great-Aunt Agatha had a Venetian home. 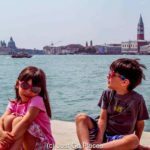 The 4 star hotel in Venice is family run. The building began its life as a warehouse to store the sweets made by the Venetian Dolcetti family. 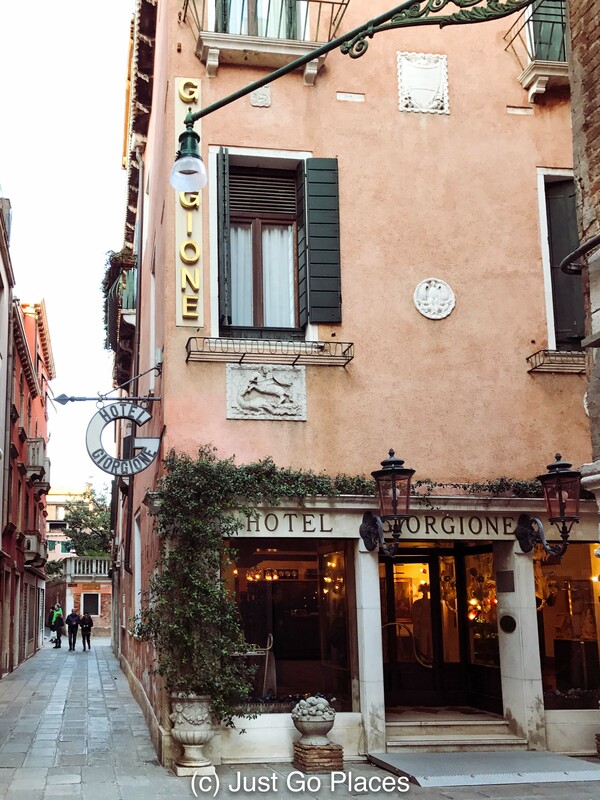 In the 19th century, the building was turned into an inn and named after a famous Venetian painter, Giorgione. The hotel stayed in the Dolcetti family through marriage (the wife of the current owner is a Dolcetti). They continue to update and renovate this historic building. 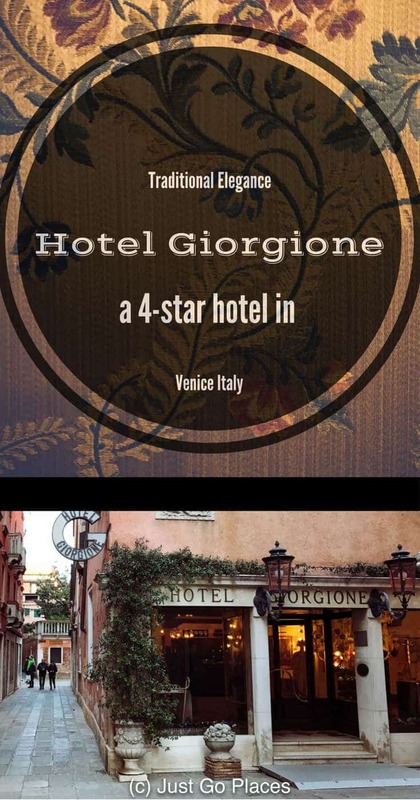 The Hotel Giorgione Venice is in the Canareggio district which is one of the less touristy parts of Venice. 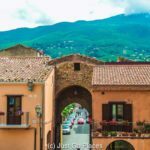 The Canareggio district though is huge and stretches for a fair bit away from the popular areas. 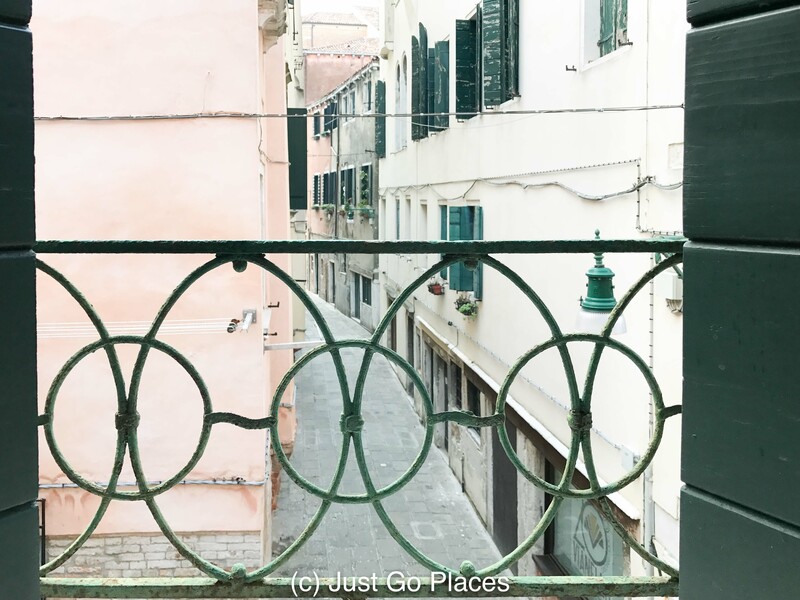 Luckily, the Hotel Giorgione is at the end of the Canareggio area closest to the Rialto Bridge and St. Marks Square. The Rialto Bridge is a 5 minute walk. St. Marks Square is a 20 minute walk across 4 bridges (if you don’t get lost, and then all bets are off). There are plenty of signs that point which way to go. I had no problem navigating my way but my husband got lost pretty much every time. 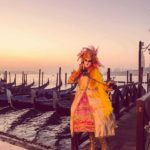 I really enjoyed being out of the main tourist loop for Venice Carnival. I had no idea that a 5 minute walk could make such a difference. The Rialto Bridge is packed pretty much all day and night, except for 6:00 AM. I know this because I had to walk to St. Marks Square to take a photo tour with Mediterranean Photo Tours. The streets were eerily quiet without the buzz of people, and the Rialto even more so. 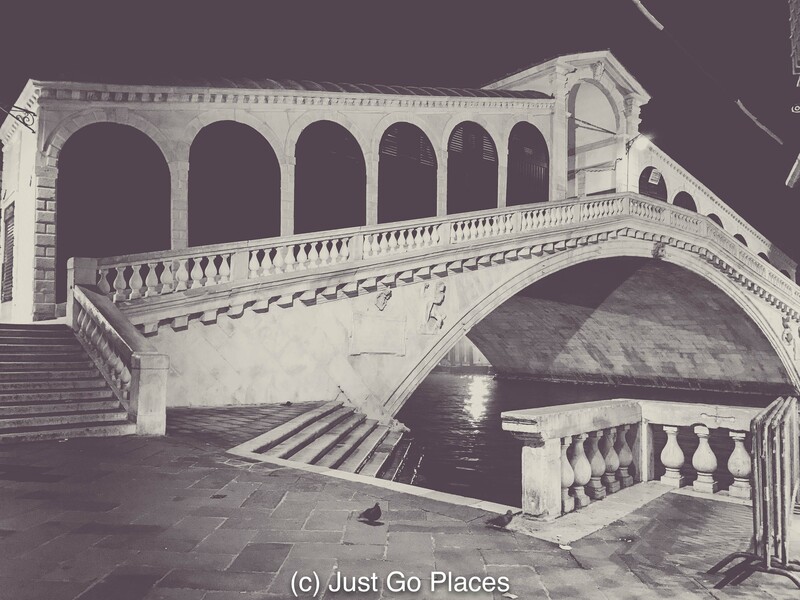 Can you believe this is what the Rialto bridge looks like empty? From the hotel, we heard church bells on Sunday morning. I threw open the window and watched nuns walking to church. And, then we went to see the Flight of the Angel at Carnival and my peace was shattered. But it was a wonderful interlude in the room anyway. The view from our hotel room window down an empty side street. 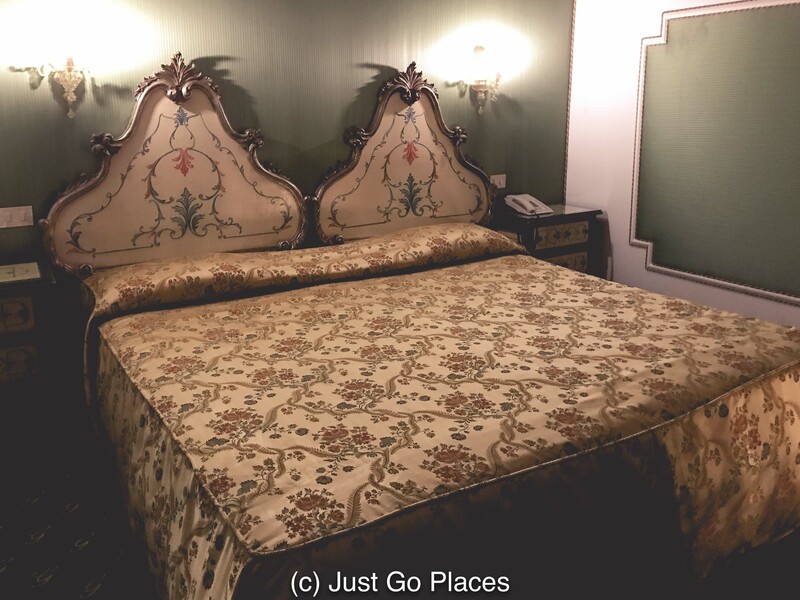 First of all, the decor of the Hotel Giorgione may not be to your taste. 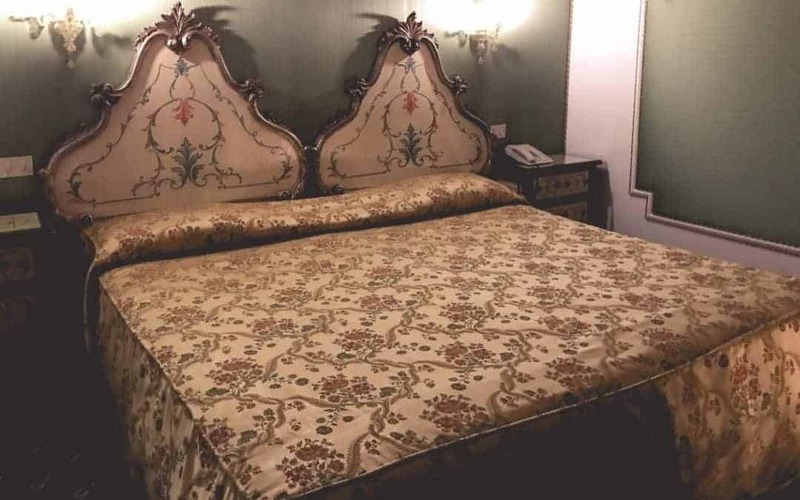 There are lots of antiques and the rooms are swathed in traditional fabrics. The floors are the traditional terrazzo (battuto) which was made famous by Venetian artisans in the 15th century. We really liked having a duplex room. The master bed was up in a loft area. Downstairs, two single beds were set up for our children. We had plenty of space for all of us. As you would expect, there was lots of Murano lighting all around. The duplex room is perfect for families. I don’t mind old-fashioned in the bedroom but I really hate old-fashioned bathrooms. 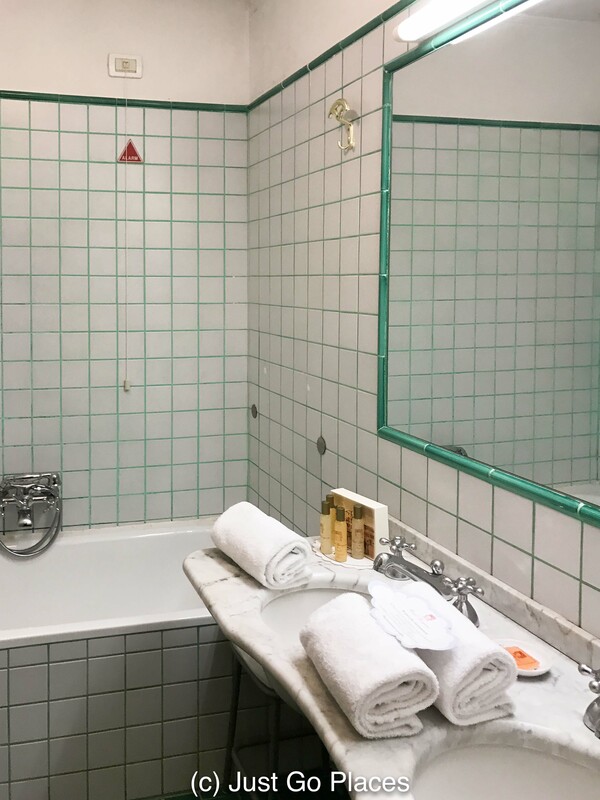 Our bathroom was a weird design of white tiles with mint green grouting and the colours were reversed on the floor (green tiles with white grouting). I found the effect a bit psychedelic and harking back to the 1970’s. The bathroom was a bit dated and not as posh as the rest of the furnishings. Speaking of heat, we had to ask to have the heat to our room turned down. Our room was baking hot. The hotel is well-heated and as you know, hot air rises. The downside with having our master bedroom upstairs was that we were sleeping in a sauna. When we left the room, we tried leaving our window open a smidgeon to air it out. In the end, we gave up and just asked the hotel reception to turn off the heating to our room completely. We found the service at the hotel very helpful and excellent. They were able to organise a water taxi for us to the airport, make assorted reservations for us and give us directions when we asked. Connected to the hotel was the Osteria Enoteca Giorgione where we ate dinner one night. The pasta is made fresh every day and was delicious. My husband said the wine selection was fabulous. 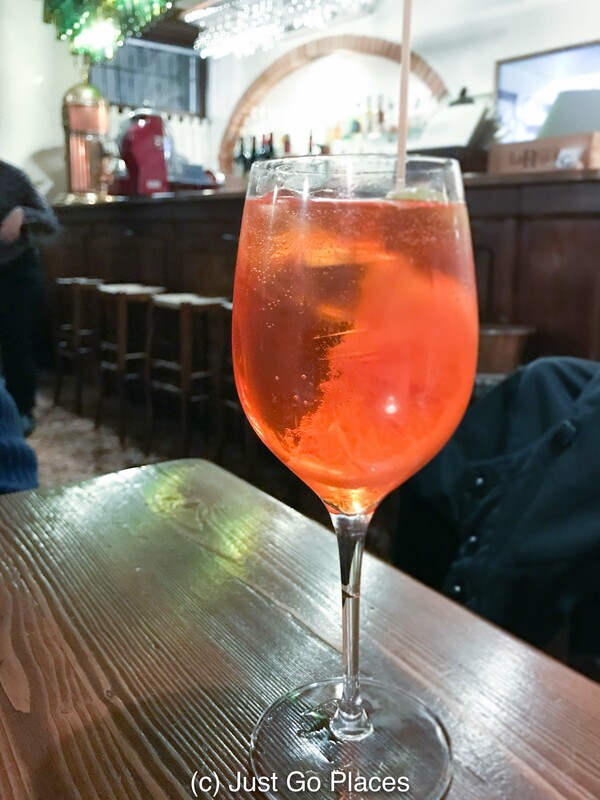 I stuck to the famous Venetian Aperol Spritz which technically is an aperitif of prosecco, club soda and Aperol. I did the tourist thing and drank it with my meal too. Don’t be put off by it’s orange colour, the Aperol Spritz is delicious. Breakfast is included in the room rate. It was pretty simple and nothing special. My children were sad that the outdoor pool was not open for use. The WiFi is free and not great. We would occasionally get bursts of WiFi in our room. The best location for WiFi was in the downstairs lobby and people would congregate on the chairs and sofas there. 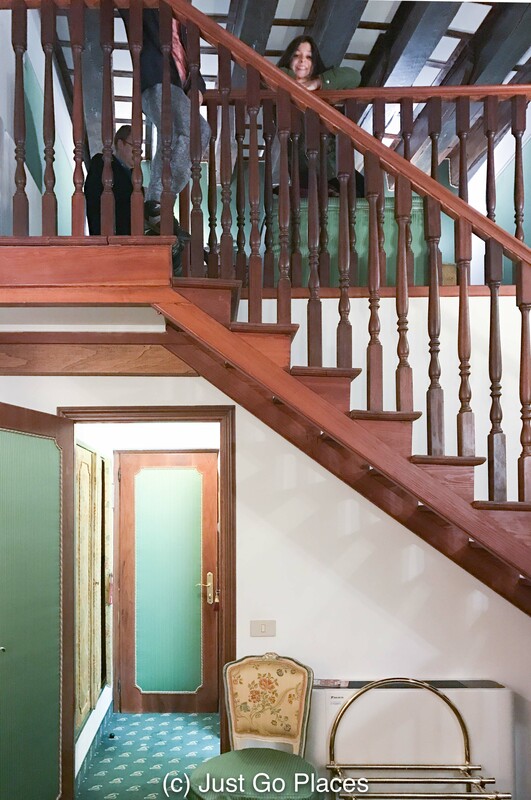 The quiet location of the Hotel Giorgione belies the fact that it is only a 5 minute walk to the Rialto bridge. The downstairs lobby area has a lot of little seating areas which are comfortable to relax. The billiards room was requisitioned by a Carnival costumes atelier. The courtyard pool would be a welcome respite during the summer heat. The upstairs bedroom in our duplex was massive. Stairs lead up to a bedroom loft. 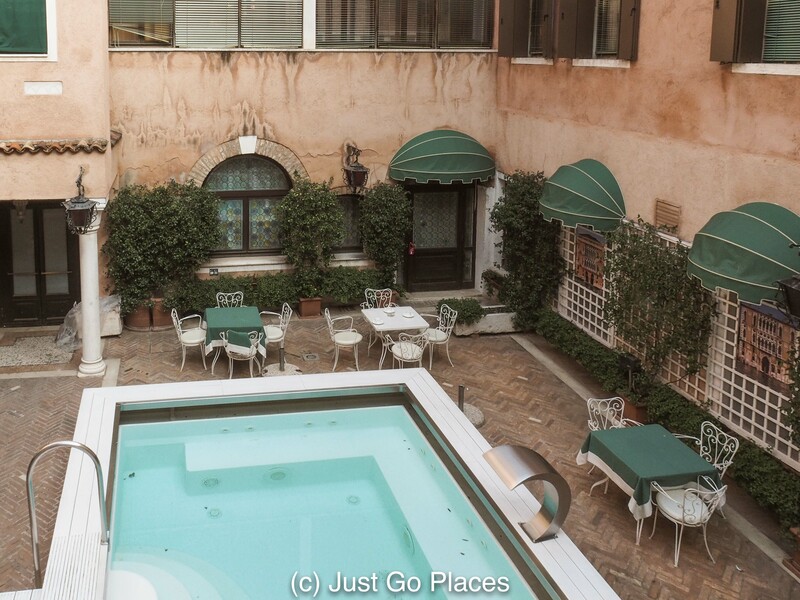 We booked Hotel Giorgione Venice through Jetsetter, a TripAdvisor company which had the best deal on the internet during the Carnival period for this hotel. Alternatively, check out the prices for the hotel on Booking.com or TripAdvisor reviews of Hotel Giorgione. 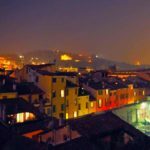 You can also check the TripAdvisor reviews of Hotel Giorgione. This post contains affiliate links the policy for which may be found on the Disclosure Page.